The antique doll market is being flooded with what I call "Frankendolls," new dolls cobbled together out of old excavated parts. Since the reunification of Germany, collectors and dealers have been excavating doll parts and figurine fragments from the massive dumps behind the former doll factories in the Thuringia area of Germany, such as Hertwig and Company and Limbach. Some dealers are piecing together these pieces, creating new dolls out of old parts. I call these creations "Frankendolls," because they are made up of buried parts and brought back to "life." 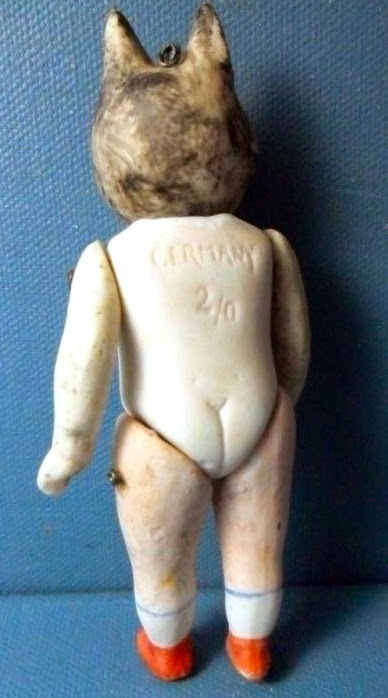 The enormous dumps of the old porcelain German factories were largely made up of rejected or defective parts tossed out before dolls were actually assembled. Further, there are many thousands of discarded parts buried in these dumps, and each factory had its own dump. The chances of excavating a complete doll torso AND its original matching limbs and head are pretty much zero. 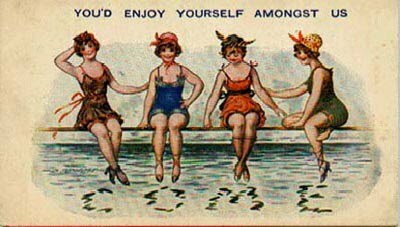 Unfortunately, these Frankendolls are often being offered through deceptively worded advertisements as antique dolls, and rare ones at that. They are NOT antique. They are NEW dolls made out of old disparate parts. In addition, these are fantasy pieces, dolls that look nothing like the dolls actually produced by these German factories. Many of these dolls are what I call "neckless wonders." Using a fine drill, the neck of an old excavated doll body with a broken head is cut out and sanded down. A new old head, from a broken figurine, doll, or nodder, is the fitted into the oversized neck socket, creating a swivel-neck doll. Because the body has no neck, the head sits typically sits between the doll's shoulders. Often, to attach the salvaged head to an excavated torso, a hole is drilled in the top of the head and wire strung through to the head and attached to the wire joining the arms. German swivel-neck dolls were NEVER strung this way. German factories did make nodders (some call them knotters), which were small comic figures with an immobile body and a turning head. Nodders/knotters did not have jointed arms and legs and were strung with elastic, which was often pulled through a hole on top of the head and knotted. But any doll with jointed arms and legs and a swivel neck joined with wire coming through the top of the head is certain to be a Frankendoll. 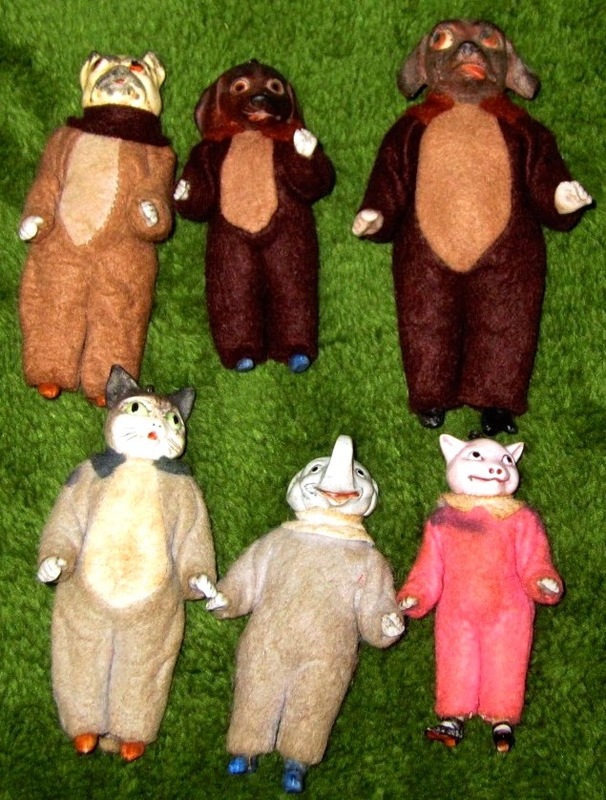 Below is a typical no-neck Frankendoll with a cat head that a friend of mine recently bought, thinking it was an antique. Note the wire coming through the top of the head. Because the arms and legs come from different dolls, the match and fit between the body and limbs are poor. Even the least expensive original German all-bisque dolls had good proportions and matching limbs that fit well with the body. In addition, the excavated pieces often have stains, rust, and dings from being buried in the ground for decades that even cleaning, bleaching, and recoloring cannot entirely remove. Some dealers hide all these defects by clothing the dolls in costumes of felt or vintage-looking material, sometimes even offering dolls in their "original" boxes. Below is a group of these dressed Frankendolls. 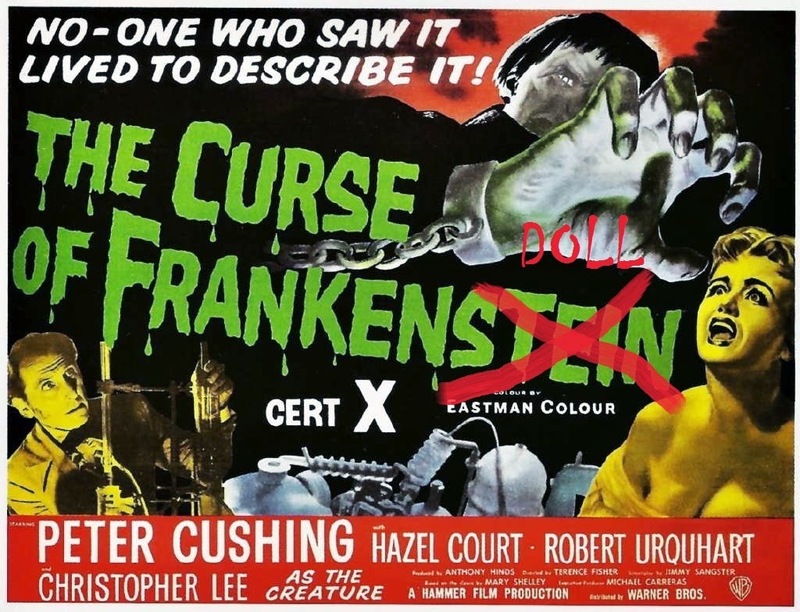 Cutely costumed, the dolls are quite appealing, and I have no issue with them being sold as craft or artistic creations. However, they are NOT antique and they are NOT rare. A doll made out of antique parts is not an antique and a fantasy creation is not an authentic rare doll! As can be seen from the picture below, taken by Galina Heinze at a May 2014 doll festival in Neustadt, Germany, not just animal heads are used. Looking at the enormous array of Frankendolls displayed for sale, you can see dolls with heads of soldiers, military figures, clowns, children, and comic characters. 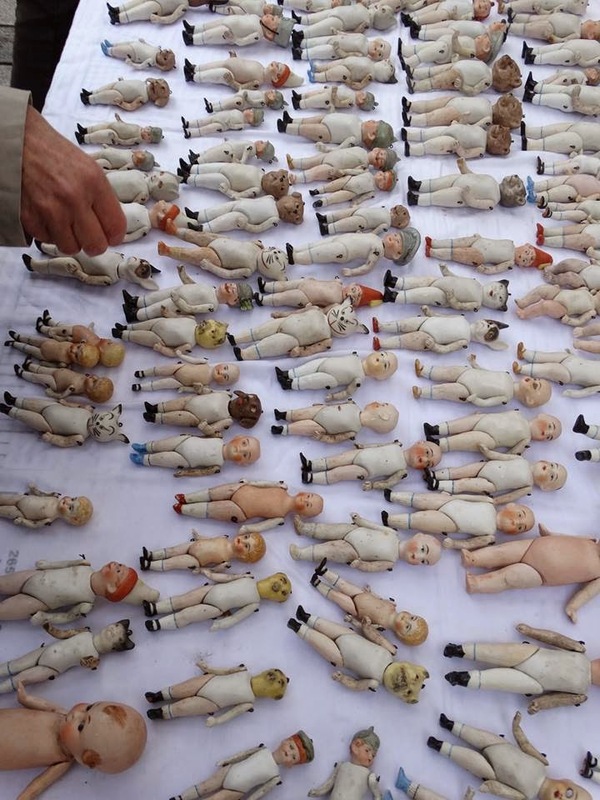 This picture illustrates the vast number and variety of the Frankendolls that have entered the antique doll market. Note that many of the heads are duplicated. It is clear that Frankendolls have evolved to a new stage--the once excavated heads (and no doubt body parts as well) are being reproduced! So now a purchaser of a Frankendoll cannot even take solace in thinking that at least the mismatched parts are old! 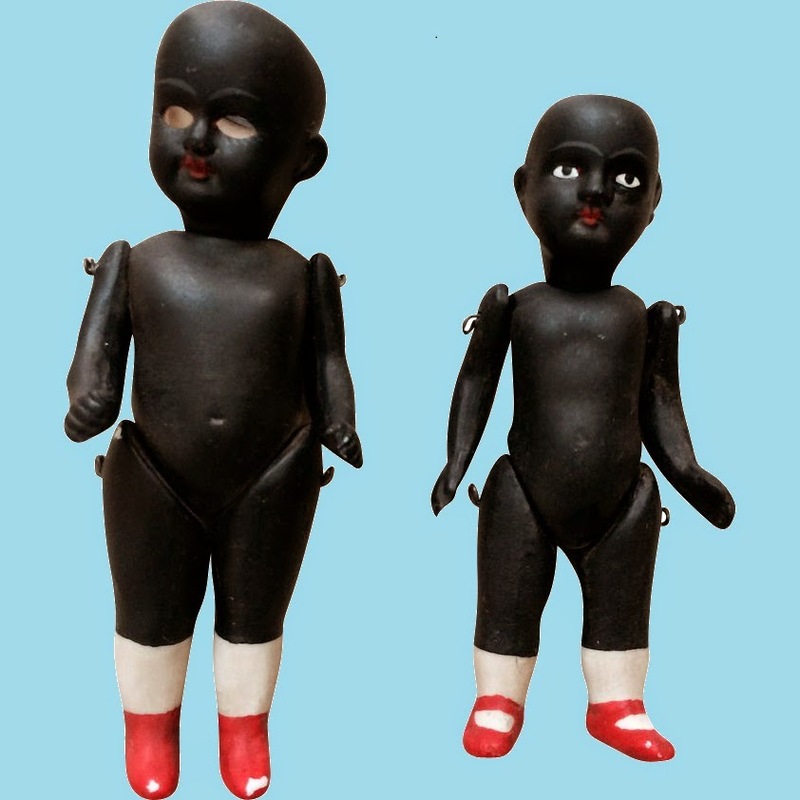 Another way of hiding the rust and stains resulting from decades buried underground is to refire these dolls with a very dark brown complexion coat, making a "rare" Black or ethnic doll. This sort of solid smooth dark complexion is not found in antique dolls. Often, bright colored socks and shoes are painted over the dark coloring, another detail not seen in antique dolls, and some even have light-colored eyelashes so that the lashes show up against the very dark complexion. On top of that, the fit and proportion of the limbs and body is still poor, and again these dolls are often dressed in to disguise these defects. I have a box full of antique bisque parts (many broken) for miniature German dolls. I know that although they are antique there is nothing rare or valuable in amongst my treasures. I've been meaning to turn them into something like the Frankendolls you are describing. For my own entertainment, and because I believe that any item that is restored to a point where it is attractive enough to be displayed and enjoyed is better than someting that is buried in a box. When I mentioned the idea to some antique doll collectors they were horrified and I thought I'm the only deviant who would stoop to such a heinous deed. I shelved the idea. Now I'm wondering whether it would not be OK to go ahead and just do it. I would never be so conceited as to offer them as antique dolls or rare dolls. This seems to be your only objection to making these 'altered art' pieces. Do I have permission to go ahead and play? As I said above, I have absolutely no problem with the Frankendolls being offered as artistic or craft creations. Some of them are pretty darn cute, especially when dressed. In fact, I often wished I could get my hands on a big batch of excavated doll parts so that I could try my hand at a little "Frankendolling." My objection is when these dolls are misrepresented as rare antiques, sometimes selling for hundreds of dollars! My only suggestion is that you sign and date your creations, such as with indelible paint or an engraving pen. This will not only ensure that the world knows of your artistic genius, but will prevent some third party from later trying to sell your art work as authentic German antiques. Send me some pictures of your completed creations and I be happy to post them! For heavens sake, you don't need anyones permission to enjoy your own possessions - do what makes you happy - just don't try to pass it off as something that it isn't. Some of the dolls on that table are real cute. I remember being told long when I first started doll collecting that each part of an all bisque doll should have the same numbering on each part. That may be true of the better doll makers. It may be one way to check and see if you have a frankendolly. I always say, let the buyer beware. One should be somewhat knowledgeable about what you are interested in. I would think these dolls don't look quite right, but an inexperienced doll collector may not know this. There are always going to be shysters, but I would say to have fun with the bits and pieces and see what you come up with and sell them as your own creations for what is fair. Very Interesting! Wish I had some of these treasures! I have been buying broken doll pieces for years. I felt so sorry for them, lying on a counter in an antique shop in Leipzig. I have a large dollhouse collection. I have loved using beautiful heads on body's and with limbs sculpted from Prosculpt. My doll family is expanding every month. In October, the beautiful ghosts will start appearing . They are beautiful white China heads and white limbs, dressed in shabby white and cream silk and gauze. I think the dolls finally have a chance to be what they were intended to be originally, a thing of beauty. Personally, I think it is wonderful when talented artists rescue broken dolls, giving then new life as artistic creations. My only suggestion is that you permanently sign and date your little dolls. This will not only ensure that the world knows of your artistic genius, but will prevent some third party from later trying to sell your art work as an authentic antique. Send me some pictures of your "beautiful ghosts" and I be happy to post them!